Published: June 2, 2014 at 12:50 p.m. Updated: June 2, 2014 at 01:13 p.m.
Fast, meet faster. There are a lot of college football players who can scoot down the field and have another gear to pull away when an opponent comes close but who are the elite sprinters in the game? CFB 24/7's "14 for '14" series continues with a list of the fastest FBS players in the country. In addition to being one of the fastest players in the country, Darby might be one of the quickest. 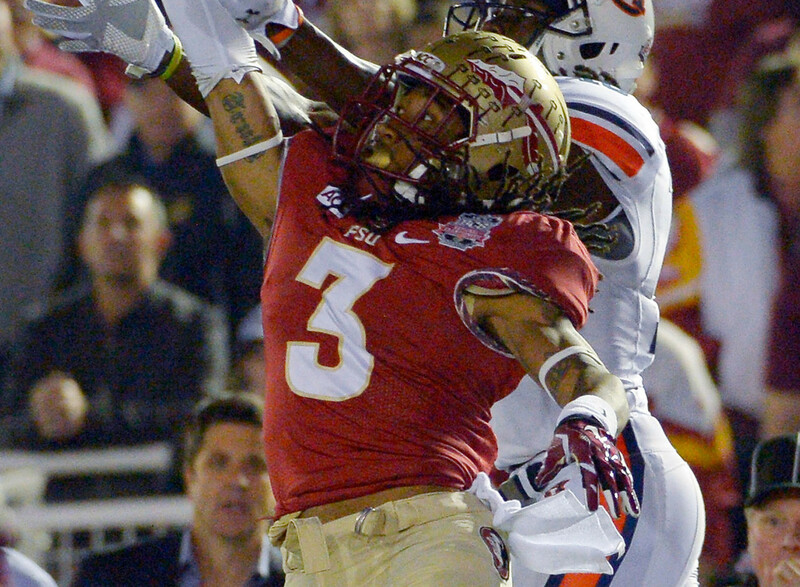 He's turned in two great seasons as a Seminoles corner and was the ACC Rookie of the Year as a freshman. Back in high school he posted a 21.05-second time in the 200-meter dash. Evans should be fully healthy when fall camp rolls around after tearing his ACL last season. He might have been further up this list had he not gotten injured, as he has had quite the track career that included a 10.39-second 100-meter dash back in high school. The Longhorns could use his speed and cover skills given some of the offenses they face in the Big 12. Teammate Artie Burns certainly has a case of his own, but Dorsett is a tick faster as a sprinter and, on the field, as a wide receiver. He's reportedly run as fast as a 4.29-second 40-yard dash, posted a 10.58-second time in the 100 meters last month and could be primed for a breakout year if he can limit his drops. He was just a hair slower than Alabama's Tony Brown last summer at The Opening at Nike headquarters in the 40-yard dash and has some equally fast times in the 55- and 60-meter dashes on the track. Urban Meyer knows how to identify speedy slot receivers and has himself another one in the freshman. He contributed often as a freshman last season as a punt returner and has the speed to create separation at wideout. He's also on the Horned Frogs' track team with Kolby Listenbee, but has posted the faster 200-meter time after running a 20.61 back in March. Another standout hurdler, Humphrey heads to the Capstone as a five-star corner in high school. He comes from a very athletic family (his dad Bobby was a star for Tide and spent several years in the NFL) and should push teammate Tony Brown on the track and on the field. His times are very similar to Cal's Khalfani Muhammad's times, but he's had a more successful season on the track after redshirting last year in football. With Bralon Addison out for the Ducks, Allen could be a big contributor as a wide receiver this year and has wowed observers during spring practice. Brown figures to be in the mix at corner for the Crimson Tide as a true freshman, but is already making a name on campus for his work on the track. A standout hurdler, he finished high school as the state record holder (4A) in the 110-meter hurdles and continues to shave time off in college, including a blazing fast 60-meter hurdle time of 7.83 seconds. He's small, but he can shoot out of a cannon on the football field. He became only the third person ever to win back-to-back sprint titles in the state of California in high school and has continued to impress on the Bears' track team. He has a good chance to be the starting running back for Sonny Dykes in 2014, too. The second-fastest man in the ACC, Snoddy is similar to Purdue's Raheem Mostert in that he's a burner on the track but hasn't seen a ton of success on the football field. At his home meet earlier in the spring, he posted numbers just a tick behind Mostert in the 100- and 200-meter dashes. He might rank third on this list, but it's a very narrow gap between the three. If you want to see how fast he is on the football field, just pop on the tape of the national title game and watch him outrun Auburn on the 101-yard kick-return touchdown that gave the 'Noles the lead. Another player who's had some explosive plays on the football field but has found more success on the track, Listenbee finished fifth in the 100 meters and fourth in the 200 meters at the Big 12 Championships in May. His 10.12 (wind-aided) was the fastest 100-meter dash by a FBS football player during the track season. No speed in the Big Ten? Think again. The Purdue running back qualified for NCAA Outdoor Track and Field Championships in the 100 meters, 200 meters and 4x100-meter relay this year. He hasn't made a huge impact on the field for the Boilermakers, but is an ace return man.